These early 1960’s small rose dial TUDOR OYSTER PRINCE watches are very sleek on the wrist. 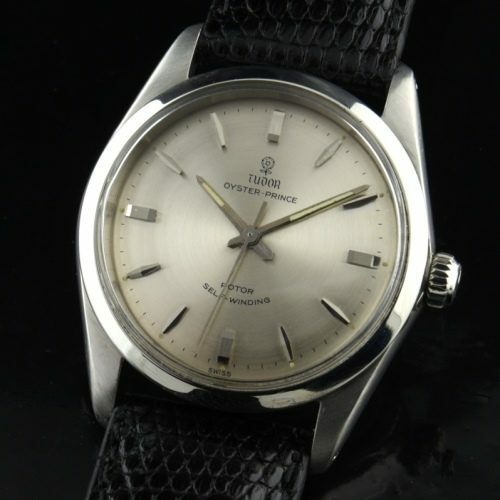 This silver completely original dial is essentially pristine and retains the original hands and luminous. The 34.25mm. Rolex Oyster case and ROLEX winding crown are also shimmering and scratch-less. This automatic winding TUDOR movement was just cleaned and is accurately keeping time. This dial is more of a dark silver, adding to the visual appeal of this clean-lined vintage TUDOR. It’s becoming harder and harder to find original dial ultra-clean TUDOR examples such as these.